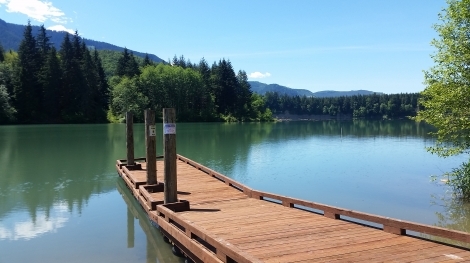 The Day Use Park is situated at the east end of Lake Scanewa where the Cispus and Cowlitz Rivers meet. 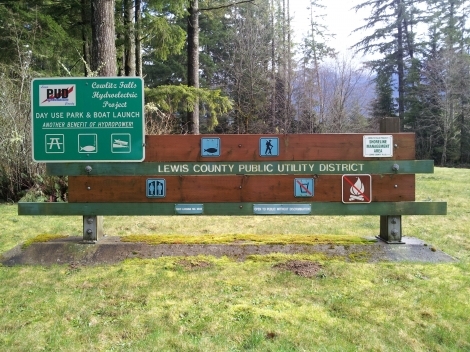 The park is also just a few short miles from the Leonard “Bud” Allen Park/Cowlitz Falls Campground and provides a perfect backdrop for picture-taking. Amenities offered at the Day Use Park are picnic tables, boat ramp with dock, a swimming area and a restroom facility. No overnight camping is allowed. The gate is almost always open, year-round from dawn to dusk and use of the park is free. Please call our Recreation Hotline number of (360) 345-1484 for Up-to-the-Day Information, especially during possible High Water Events, for possible gate closures. Please refer to the Washington State Fish & Wildlife regulations for fishing season information. Watch for our annual Kid’s Fishing Derby that coincides with the “Free Fishing Weekend” in Washington. From Morton take Highway 12 east to Savio Road. Turn right and go to Kiona Road. Turn right and follow Kiona Road to Falls Road. Turn right and continue to the Day Use Park on the left. From Yakima take Highway 12 west to Savio Road. Turn left and go to Kiona Road. Turn left and follow Kiona Road to Falls Road. Turn right and continue to the Day Use Park on the left.